On July 5, 2015, (Sunday) at 4:30 PM CDT, my son and I were hanging up new flags on my flag post. He was hoisting up the flags, so I was looking into the sky, watching them go up. Much to my surprise, right in my line of sight, a UFO was passing overhead. It was traveling from due South to due North at what appeared to me to be a very high velocity. It was snow white with no visible markings or lights. I had a very clear view of it before it disappeared out of my sight. I could clearly see it for about 5 to 10 seconds. If it was the size of a 747, I would estimate the altitude at 2500 to 3500 feet. My gut feeling is that it was much larger than a 747. It was traveling at an angle of about 70 percent from the plane of the earth. At speed and angle traveling it looked like it was heading into orbit. To our South was a large bank of white clouds – the north was deep blue clear sky and very clear visibility with no haze or air pollution. After I have had time to reflect on it, I think it may have been cloaked white, while it was in the clouds, and not cloaked to blue in time not to be seen. At rate of speed and angle of ascent, it could not have left the ground more than maybe 10 miles South of my location. and there are no known airports or military base in that area. It had two short stubby wings in the front, about 10 to 15 percent from the front of the fuselage. These apparent wings were only about 5 to 10 percent of the length of the fuselage. Very short and nothing like I have ever seen before – almost like the were just stabalizers while in flight in the atmosphere. The front of the craft was rounded like a normal plane. The rear was also rounded and only about 25 percent as wide as the front. There was absolutely no tail gear on it that I could discern. ((NUFORC Note: We spoke via telephone with this witness, and we found him to be quite objective in his description of the object, and seemingly quite sincere. He is a former member of the U. S. military, and we suspect that he is a very good witness. PD)) NOTE: The above image is a rendering. 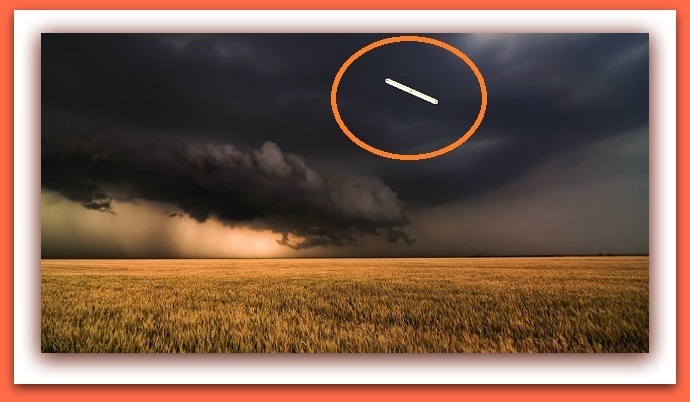 This entry was posted in ABDUCTION, best ufo photos, incredible ufo photos, MISSING TIME, top ufo news, UFO, UFO ARTICLES, ufo news, ufo photos and tagged 2015 GLENPOOL OHLAHOMA CIGAR UFO CYLINDER, 2015 OKLAHOME CYLINDER UFO CIGAR, 7-5-15 OKLAHOMA CYLINDER CIGAR UFO, 7-5-15 OKLAHOMA CYLINDER UFO CIGAR, air force ufo, ALIEN CRAFT, animal abduction, army ufo, best ufo images, best ufo photos, best ufo pictures, best web site world ufo photos, boomerang craft, chief investigator, civilian panic, commercial pilot ufo, crashed disc, cylindrical craft, diamond ufo, DISC, discoveries on mars, discoveries on moon, FLYING SAUCER, government black ops, I.S.S. UFO, international space station and ufo alien craft, JULY 5, KEN PFEIFER, ken Pfeifer discoveries, Ken Pfeifer State Director for MUFON in Rhode Island, Ken Pfeifer State Director for MUFON in Vermont, largest ufo photo website, LIGHT, LIGHTS, marine ufo, MARS, mars discoveries, mars photos, MEN IN BLACK, MOON, moon discoveries, moon photos, MUFON, national press club ufo, navy ufo, ORB, ORBS, pfeifer, pyramid ufo, radio ken Pfeifer, rectangle ufo, Saturn discoveries, saucer, secret society, State Director Ken Pfeifer for MUFON in New Jersey, STRANGE, sun photos, swamp gas, TRIANGLE, ufo, ufo crash, unidentified submerged object, unidentified submerged objects, uso, world ufo photos and news, world ufo photos is the largest UFO photo website in the world, worlds largest UFO website is world ufo photos.org by KEN PFEIFER. Bookmark the permalink. I just want to mention I am new to weblog and absolutely loved your page. Almost certainly I’m going to bookmark your website . You definitely come with fantastic article content. Thank you for sharing with us your website. I was wondering if you ever considered changing the structure of your blog? It is very well written; I really enjoy what you got to suggest. Yet perhaps you could a little more when it comes to content so people might hook up with it far better. You have an awful lot of words for just having 1 or 2 pictures. Maybe you could space it out better? obviously like your website but you need to take a look at the spelling on several of your posts. A number of them are rife with spelling problems and I find it very bothersome to inform the reality on the other hand I will surely come back again. Thank you, I’ve just been searching for info approximately this topic for ages and yours is the best I have came upon till now. However, what about the bottom line? Are you certain concerning the source? we do hope you never quit! It is the most effective blogs Ive actually read. You have got quite a few insane ability here, man. I merely believe that you never loose your style simply because you are one of the trendiest blog writers out there. You should stick with it because the web needs you spreading the word. Hello, you are absolutely correct. I frequently go through your posts thoroughly. I am furthermore looking into mobile number locator, maybe you might talk about that from time to time. I will be back. I was conversing with a good friend of my own regarding this article and also about omega xl rating too. I think you made a few very good points on this page, we’re looking forward to find out more material from you. Generally I don’t learn post on blogs, but I would like to say that this write-up very forced me to take a look at and do so! Your writing taste has been surprised me. Thank you, very nice article. hello there and thank you for your information – I have definitely picked up anything new from right here. I did however expertise some technical points using this website, as I experienced to reload the web site many times previous to I could get it to load correctly. I had been wondering if your web host is OK? Not that I’m complaining, but slow loading instances times will often affect your placement in google and could damage your quality score if advertising and marketing with Adwords. Well I am adding this RSS to my email and could look out for much more of your respective fascinating content. Ensure that you update this again very soon..